Sam: With much of the running world deep in winter getting out on the trail requires suitable footwear. 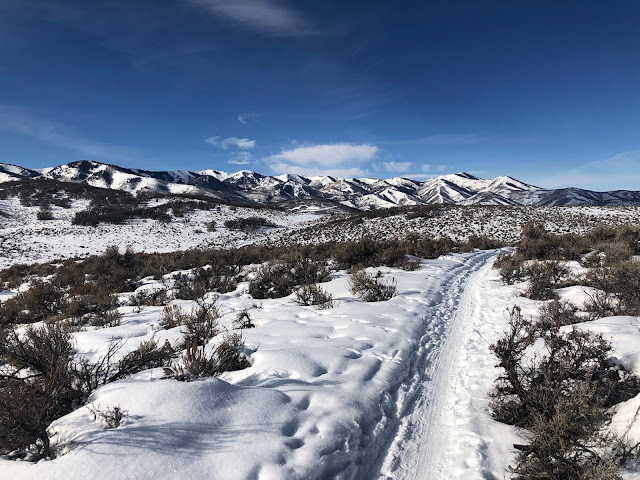 I run a lot on hard packed and softer snow in Park City, UT. 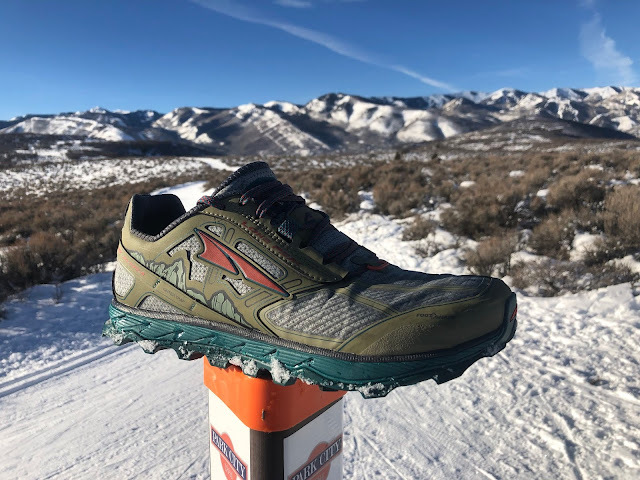 Such terrain and conditions as well as wet soft ground in cooler temperatures calls for running shoes with 2 key characteristics: deeper more widely spaced lugs for traction and an upper which can resist moisture and provide some warmth. 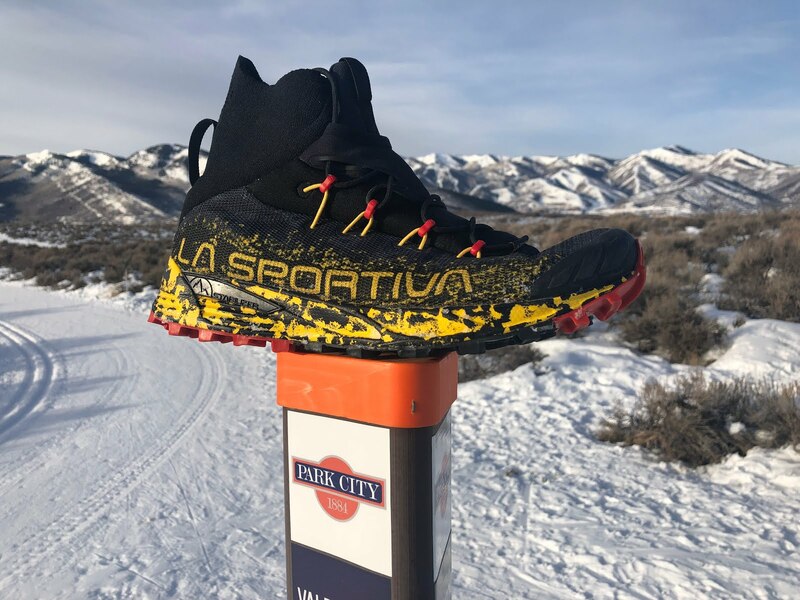 The five shoes are the top to bottom below: LaSportiva Uragano GTX, Salomon Speedcross 5 Topo Hydroventure 2, Altra Lone Peak 4.0 RSM, and Hoka One One Speedgoat Mid WP . As we are talking winter running we will first focus on the two key ingredients of winter worthy shoes: upper and traction. Sam: All shoes except the Uragano, where I was a half size up from my normal 8.5 fit true to size while wearing winter weight run socks. 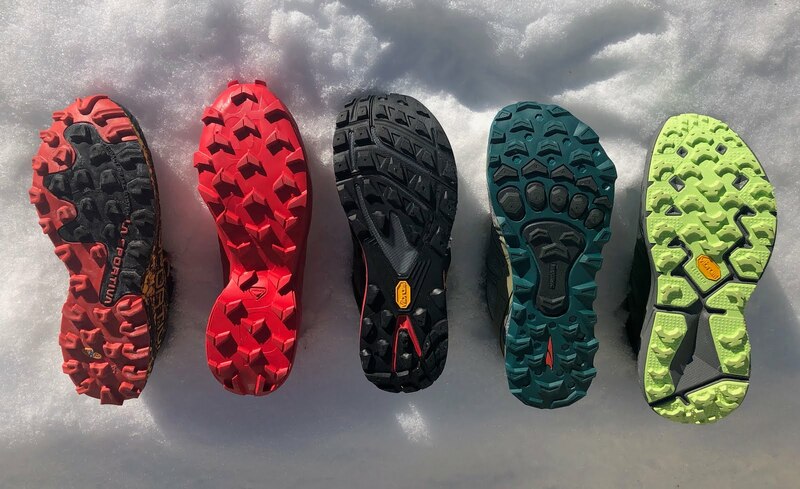 Four of the shoes tested have waterproof breathable uppers with the LaSportiva Uragano GTX having a Gore-Tex bootie construction, the Speedgoat Mid has Hoka's new Sky Shell, a bootie with the Topo Athletic Hydroventure 2 and Altra Running Lone Peak 4.0 RSM both having Vent uppers where the waterproof membrane is directly laminated to the mesh upper. Laminated uppers can be slightly stiffer than bootie construction but more all of a piece in fit and can add structure to the upper as well as support. This was clearly the case with the Lone Peak. I have tested the non waterproof version and the support from the eVent upper is clearly superior at mid foot and in the toe box. Almost too supportive at mid foot in fact, and a bit awkward in its complexity as it also includes A Straps running from lacing to midsole for support. It is easy to lace very differentially and I did to reduce top of lace up pressure. I appreciated the added support in the broad foot shaped toe box that the eVent upper provided vs. the normal mesh where the room and comfort is great but the foot tends to torque more than I like. At the heel the improved foot hold continues with credit to the eVent's support although as with the normal version I wish Altra would raise the ankle collar height somewhat. The Hydroventure 2 eVent upper is somewhat thinner overall with far fewer, in fact no stitched on overlays. All the thin overlays are laminated, It fits magnificently with great front to back foot hold and less of a stiff and awkward feeling at midfoot than the Altra. It has a roomy, broad natural foot box with totally secure hold without extra straps or gimmicks. Both eVent uppers kept my feet dry and warm on runs in temperatures from 1F to about 20 F. Both the Lone Peak and Hydroventure 2 have attachment points for their respective proprietary low gaiters. 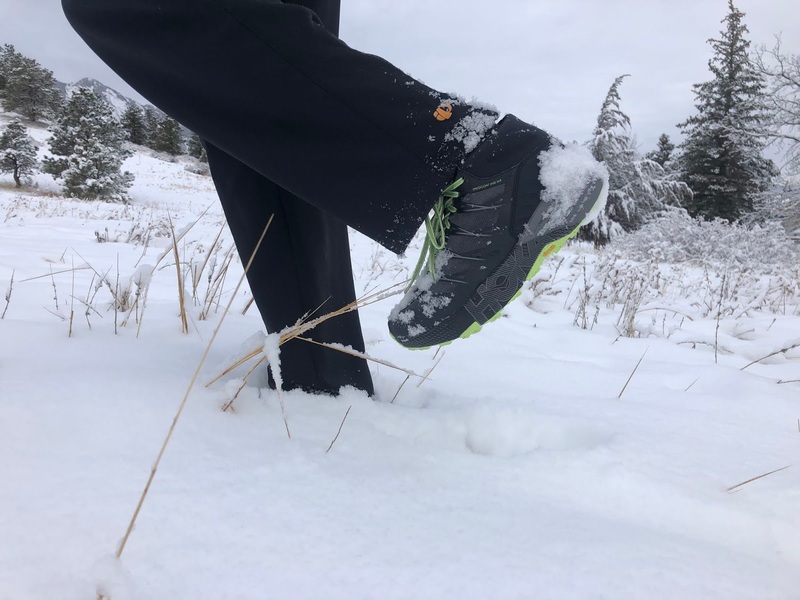 The Uragano upper differs in several ways from the others being the only Gore-Tex upper with a bootie construction instead of laminated and having a high water and debris resistant stretch cuff to keep snow and debris at bay, although the cuff is not waterproof. It is the warmest, driest shoe but not so warm that it can't be worn in milder conditions when I tested it outside of winter. I was sized half a size up and the fit is perfect, highly secure and stable from mid foot to heel with well held flexible toe box. A low top version the Tempest GTX is also available. It has the same lower construction including Gore-Tex bootie as the Uragano. The Speedcross 5 has a non waterproof upper mesh with extensive vacuum molded waterproof overlays all along the lower part of the thin and light but dense mesh upper so it is very water, snow mud and splash resistant with breathability over the toes and tongue. I actually ran the Speedcross on the coldest day of the test at about 0 F, -19 C and was never even close to cold wearing Stance merino socks. 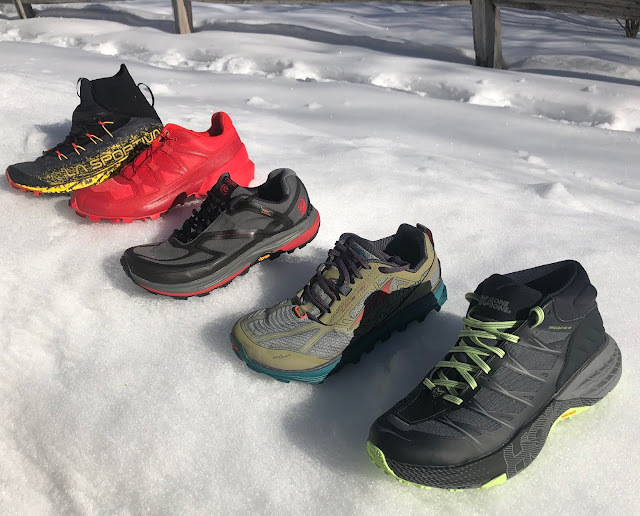 I generally winter trail run in non waterproof shoes and the Speedcross upper's balance of water resistance down low and breathability up top was the most comfortable overall and also the best fitting with the Hydroventure and Speedgoat mid coming in close second. 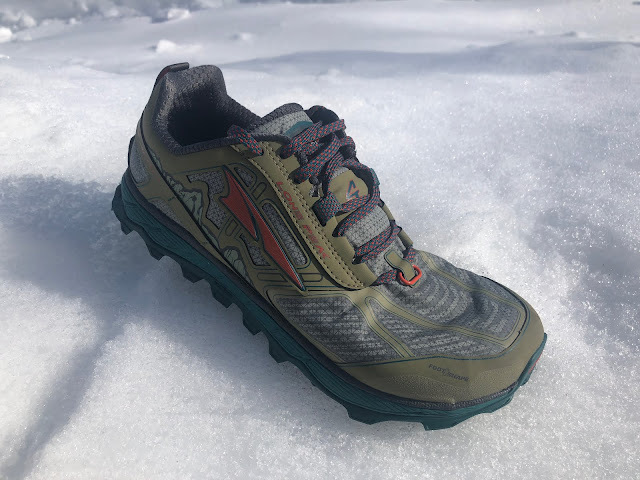 This is a roomy upper although not a super wide Altra or Topo like fit up front with about the best fit of any recent Salomon for me: secure, no pressure anywhere with, and unlike many historic Salomon plenty of well held toe box room. From seeing 2018 race pictures, I believe variants of this upper with the vacuum overlays were on the feet of many Salomon S/Lab elites, albeit on different underfoot platforms. 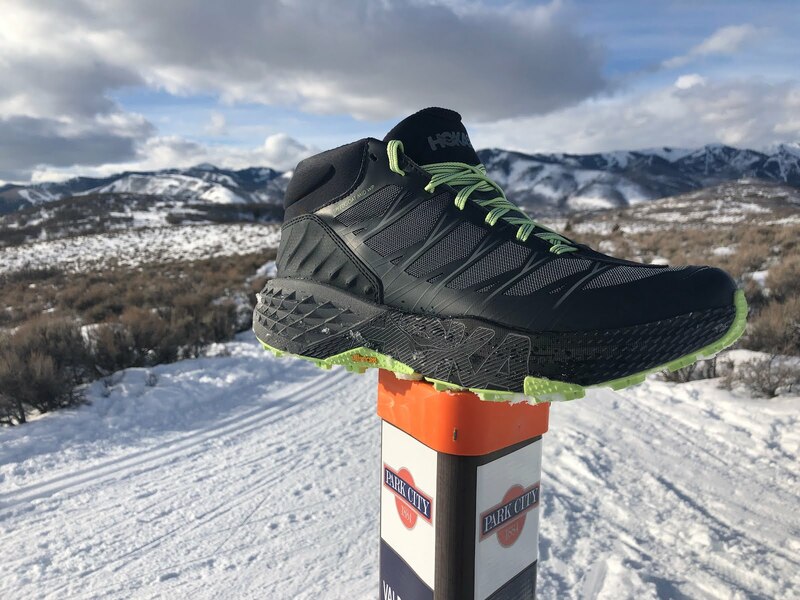 The Hoka One One Speedgoat Mid WP has the most boot like upper towards the rear and is the most pliable yet has a highly supportive fit towards the front, a great combination. While not super wide in the toe box there is plenty of well held room there. I was true to size with heavier winter weight run socks. Jeff: Sizing is sufficient for my mid weight wool socks that I would gravitate toward when wearing this shoe. I sometimes size up with winter shoes to accommodate for a thicker sock (and often more snug upper from the waterproof membrane), but do not feel that is necessary here with the SG3 Mid WP. 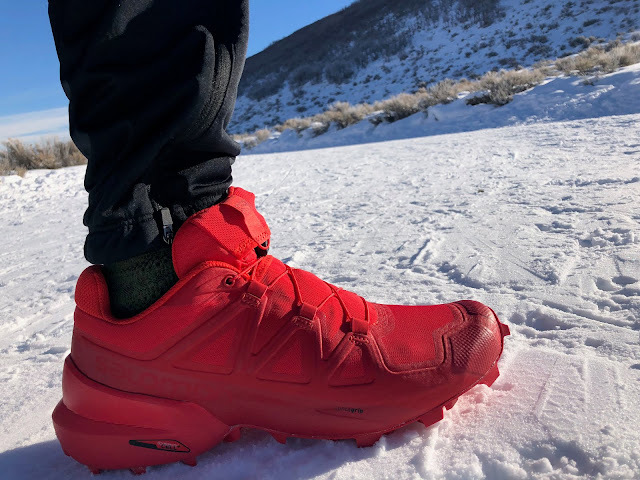 The over the ankle design helps keep out the snow, but additionally helps protect the ankles with additional padding on the EXTERIOR of the collar to further shield the ankle bones from unforeseen bang ups on rocks, the other shoe, and is especially welcome when wearing Microspikes. I have not yet used the SG3 Mid WP in temperatures less than 25 degrees, but in deep snow and sloppy slush, they kept my feet warm and dry. All of these shoes have stout traction with the Speedcross having the most prominent height lugs at 6mm plus and also the most widely spaced lugs. The others all having approximately 5mm lugs. The spacing of the lugs, their shapes, rubber firmness and their heights clearly affects performance on softer ground. Widely spaced high lugs tend to grip better and better evacuate snow and mud. On snow the Speedcross was clearly superior to the others in traction, particularly climbing traction. The trade off is that on firmer ground they can be more awkward as there is less ground contact area and the lugs are high. The Speedgoat had a good blend of well spaced deep lugs with many angles for traction. It may be the most versatile outsole for all forms of terrain. Jeff said: Traction is excellent in the snow and mud, but perhaps a shade behind the Uragano and for sure not as good as the Speedcross 5. Uragano had a great balance of grip on snow and other terrain performance and I felt was second overall to the Speedcross in snow performance, helped along by its full contact on the ground platform, more continuous and less arched midfoot than Speedcross combined with a flexible thinner very front for climbing agility. The hob nails or ice screws can be used on the others but not as seamlessly to the overall design. I wonder where to place them on the Speedcross. between the lugs where they may be too low to work or in the lugs where they may feel awkward or torque out. Not to worry, Salomon makes the Speedspike CS (RTR review) with built in carbide tipped ice traction all over the outsole. 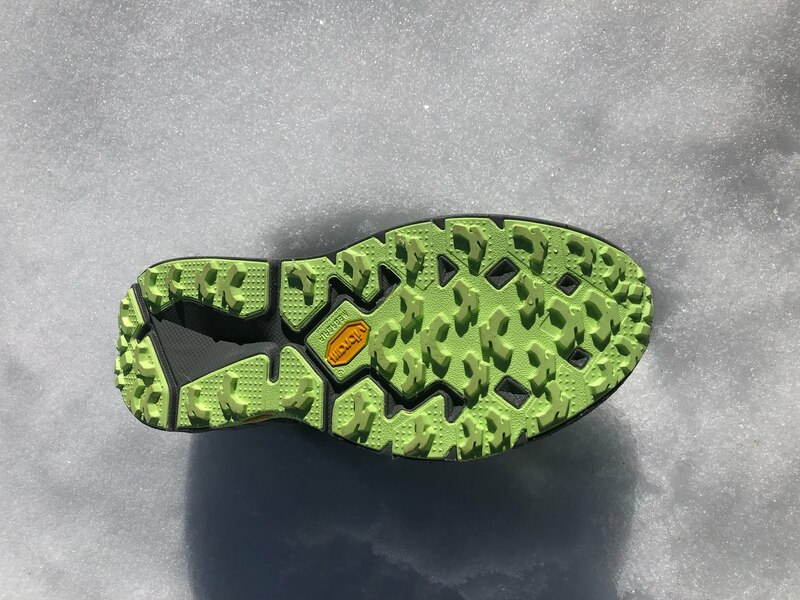 I was surprised at how well the Lone Peak 4.0 performed on hard pack snow given its lower profile more rounded lugs but I also note its green rubber was soft and compliant, not always the best on slippery rock but seemed to work well on snow. 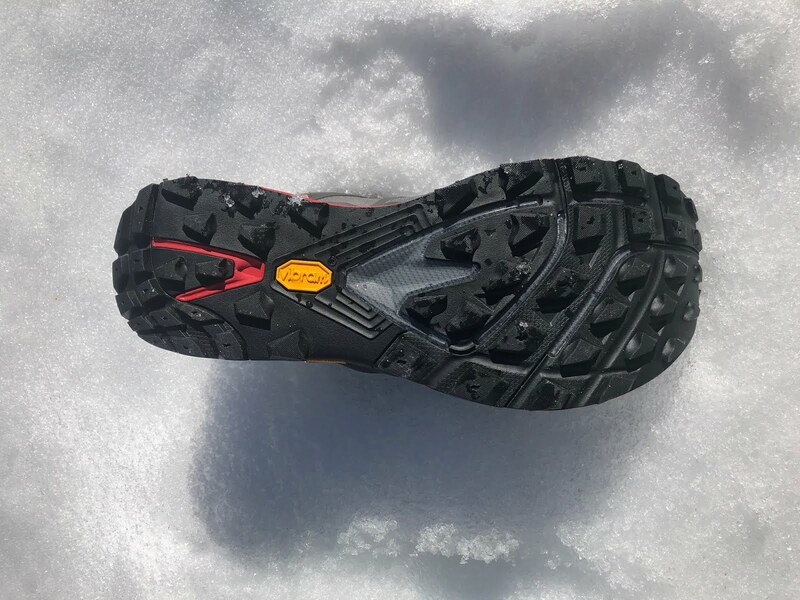 I found the Hydroventure had the least grip on snow when climbing with it seems the firmer rubber, a Vibram MegaGrip with broader flatter higher on the ground surface area lugs than the others. Now that we have discussed the two key winter features of water resistance and traction let's look at other characteristics. Next came the Speedcross at 11.2 oz / 318 g. Recall it does not have a fully waterproof upper relying on those smooth fitting vacuum molded overlays for lower down water resistance. The widely spaced lugs, narrow midsole geometry at mid foot also keep the weight off and the agility up! The Speedgoat checks in at a remarkable 11.3 oz / 320 g. Here you get not only the stoutest stack of the group but a truly supportive boot type rear of the upper. The size 9 Uragano is about the weight of the Lone Peak in a US M 8.5 as I was half size up checking in at 11.75 oz /333g. Here you get a high very protective shoe and Gore-Tex bootie. In the toughest conditions that weight and the performance overall are well worth it. Generally on snow cushion is not as big a factor as traction but after all winter fortunately or unfortunately is not year round and trail runs can include all terrain conditions during any given run even in winter. Speedcross and Uragano essentially share the same midsole stack and 10mm drop. Their thinner more flexible forefoot areas translate to the best climbing abilities of the group. 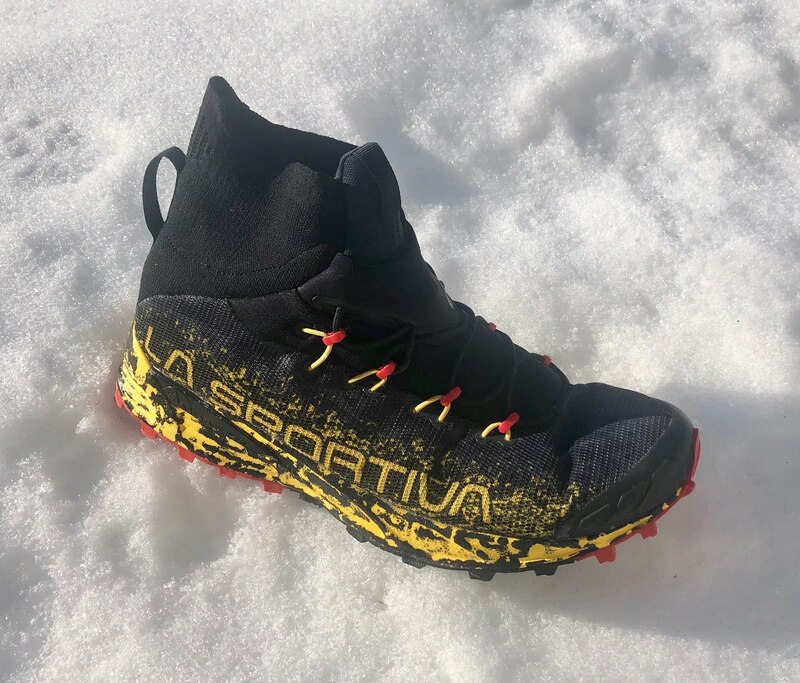 La Sportiva Uragano GTX has a less blocky heel and a wider mid foot on the ground geometry making it smoother than Speedcross on more normal terrain and is very stable on downhills as it also has side TPU stabilizers making it a good choice for those who run in support or stability road shoes. 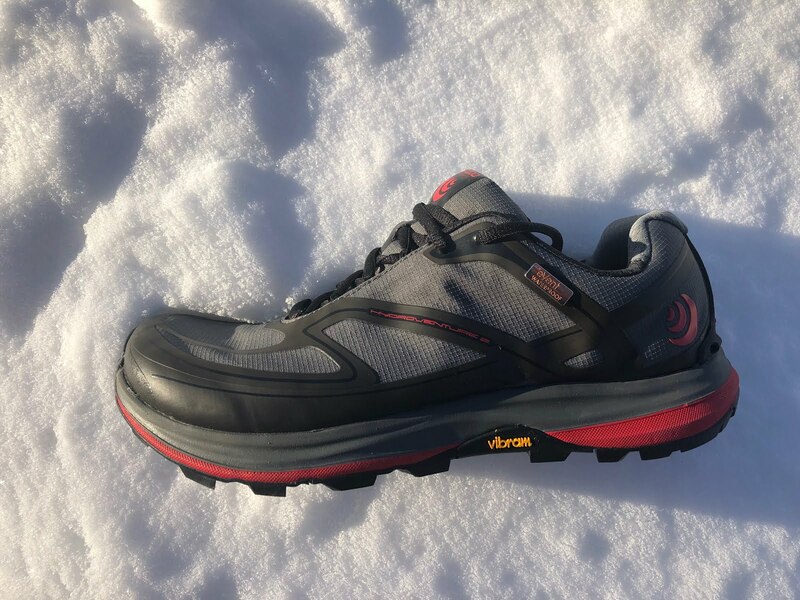 Jeff: Uragano GTX has been my go to Winter shoe since I received them in the Fall of 2017. Lighter than the Crossover 2.0 GTX with the same rugged and grippy outsole and protective midsole, the Uragano is fast, warm, protective and waterproof with a lighter weight upper and integrated form fitting gaiter to keep out snow. 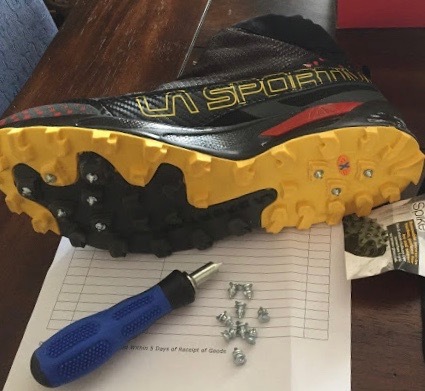 Additionally, the Uragano lugs are designed to accommodate the La Sportiva hobnails for added bite on icy surfaces. As an added bonus, they slide on easy and without even tying, are plenty secure for walking the dog or running errands on a snowy wet day. As Sam says, size up a half size at least on this one to allow for thick socks. The Uragano GTX is the shoe to pick for the ugliest conditions given its high stretch cuff upper its deep traction with an outsole design balanced to varied terrain including snow. The Uragano and can be supplemented with hob nails for the ultimate in nasty terrain security. It is ideal where steep climbing is on the menu as it has the most flexible but also least protected front of forefoot as there is no rock plate there. 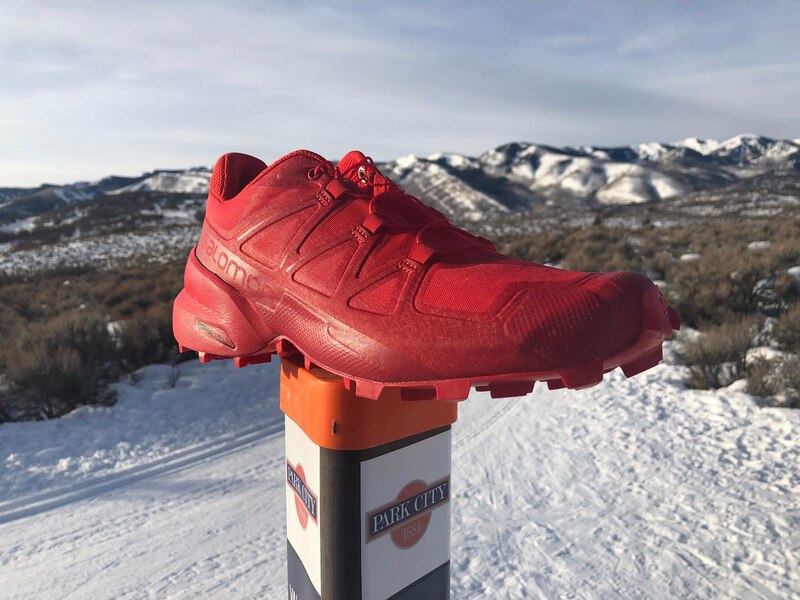 As the overall best selling trail shoe from Salomon this new Speedcross edition is more aggressive in traction and has a far smoother fitting and roomier upper. Salomon Speedcross 5 is the most agile shoe on softer ground and is the best climber of the group with great grip but is maybe is a bit less stable on firmer terrain due to its deeply craved out mid foot. It has the smoothest fitting upper, and although not fully waterproof, it is well protected down low by its vacuum molded overlays. Available soon. 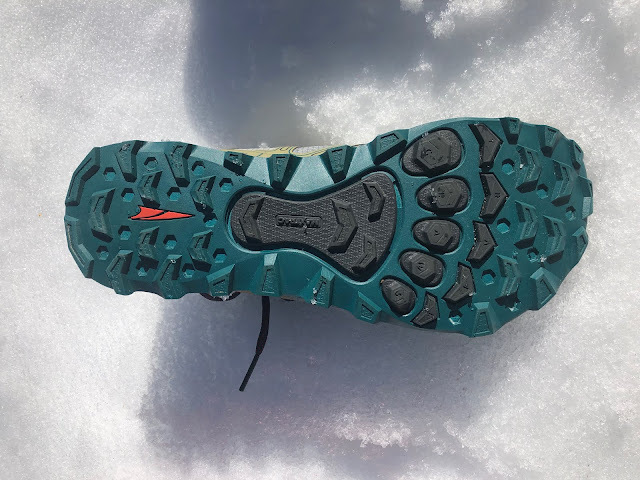 The Speedcross has the most tenacious and agile traction with the best fitting and smoothest upper of the group for me although it is not waterproof. It shines on messy loose sloppy terrain given its outsole design and is the most focused on that task. As such the Speedcross is less versatile on more moderate or firmer terrain than the others here. Speedgoat Mid WP comes in at remarkably light weight for essentially a very run able light boot. It has tons of cushioning stack and a versatile MegaGrip outsole. The well executed higher cuff is highly supportive on rougher ground. The Speedgoat Mid WP would be a very fine choice for faster hiking in my home and very rocky and rooty White Mountains of New Hampshire and I can't wait to try them there come spring. 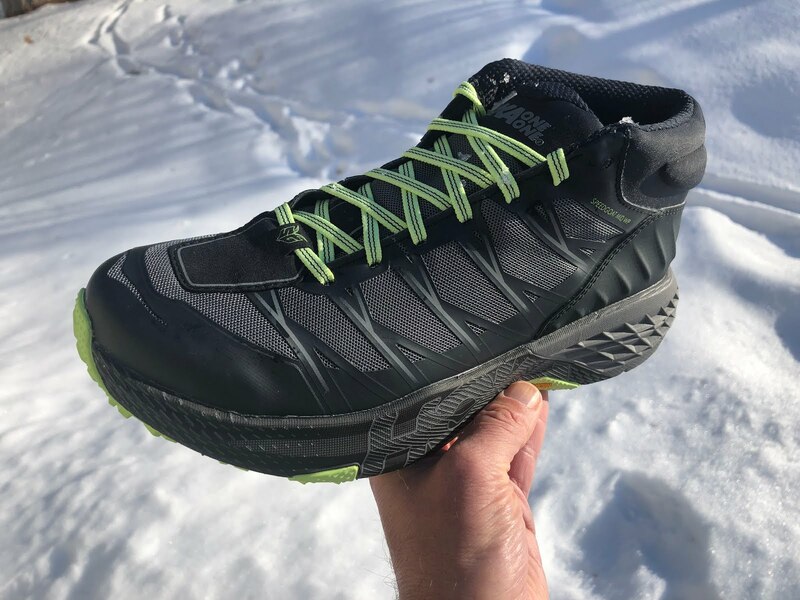 Jeff: The Speedgoat Mid WP feels like a hybrid between the regular Speedgoat 3 and the Hoka Tor Ultra Hi WP, retaining the speed, lightness and security of the Speedgoat 3, while mixing in the waterproof protection of the Tor Ultra Hi WP. The Speedgoat Mid WP feels reasonably light to me on my foot given all of the protection that it offers. The over the ankle design helps keep out the snow, but additionally helps protect the ankles with additional padding on the EXTERIOR of the collar to further shield the ankle bones from unforeseen bangs from rocks, but more commonly the other shoe, which I inadvertently do more often in the winter with unstable and unpredictable footing. This added protection is especially welcome when wearing Microspikes, running crampons or snowshoes. 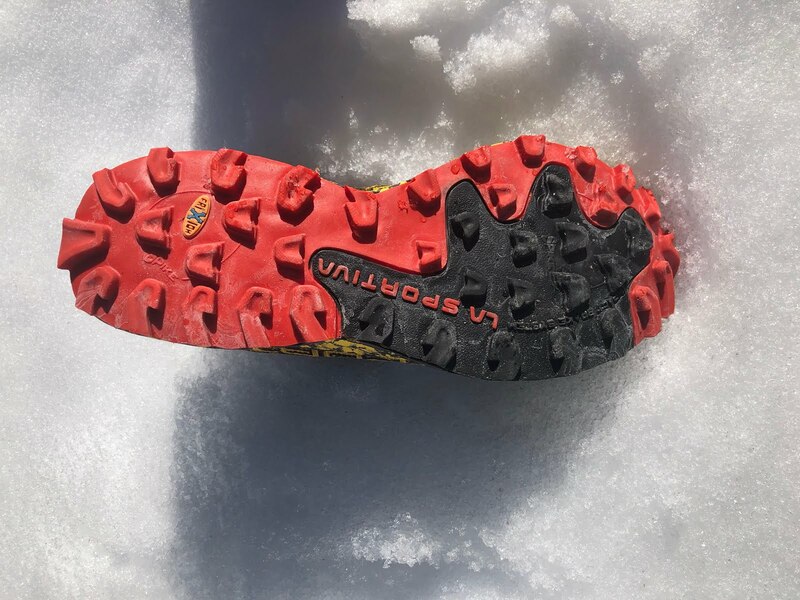 Traction is excellent in the snow and mud, but perhaps a shade behind the Uragano and for sure not as good as the Speedcross 5. The SG Mid WP pairs very nicely with Microspikes, where having all of that extra stack height and cushioning helps to make the Microspikes go unnoticed. I have not yet used the SG3 Mid WP in temperatures less than 25 degrees, but in deep snow and sloppy slush, they kept my feet warm and dry. Full review coming soon. Speedgoat Mid makes a great winter and wet conditions run and scrambling shoe. It and can be a light and protective fast packing and hiking shoe as well as winter around town shoe. 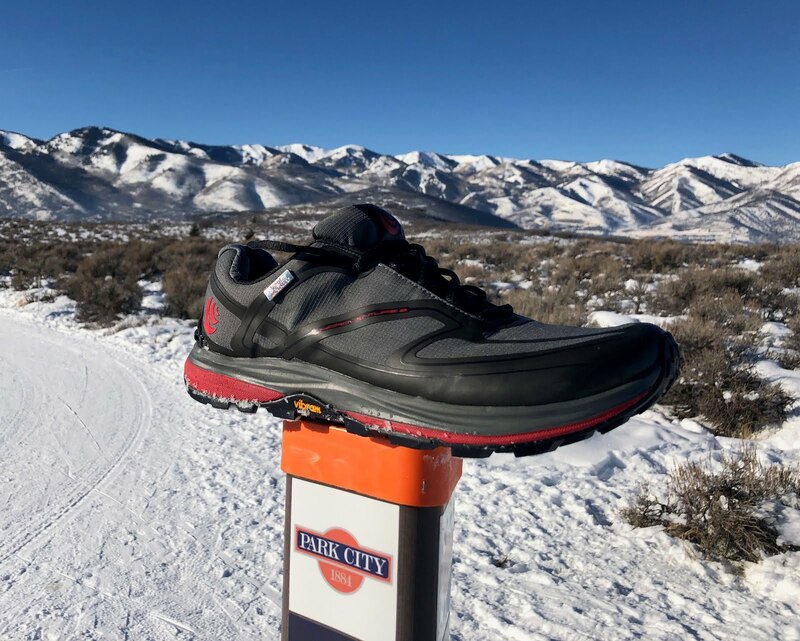 Lone Peak 4 Low RSM clearly has plenty of soft forefoot cushion stack and it is is felt, even on hard snow, with the foot also well protected by a flexible rock plate. Its midsole is soft, not really a big factor on snow but appreciated on firmer ground. Interestingly as the midsole is soft and we have a zero drop shoe on very firm ground such as pavement, the heel, while still well cushioned feels quite low. As a zero drop shoe, caution is advised if you are not used to this geometry. Take your time to get used to it particularly on firmer ground. It's eVent upper is a bit stiff especially at mid foot but provides plenty of support (more than the non waterproof version) along with Altra's trademark foot shaped toe box room and handy gaiter attachments. A Mid RSM is also available. The Lone Peak 4.0 RSM is a great all seasons all-rounder and a foul conditions option for regular Lone Peak 4.0 fans. The foot shaped, soft and comfortable Lone Peak is Altra's best selling trail shoe, the top selling thru hiker shoe, and second only to the Speedcross in US trail sales. It's traction is lower profile, more rounded but effective on snow and versatile on other terrain. Hydroventure 2 has a balanced and versatile stack and midsole geometry with a 3mm drop and a decent 22mm of forefoot stack with a rock plate. The midsole is dual density with the black areas softer than the red. 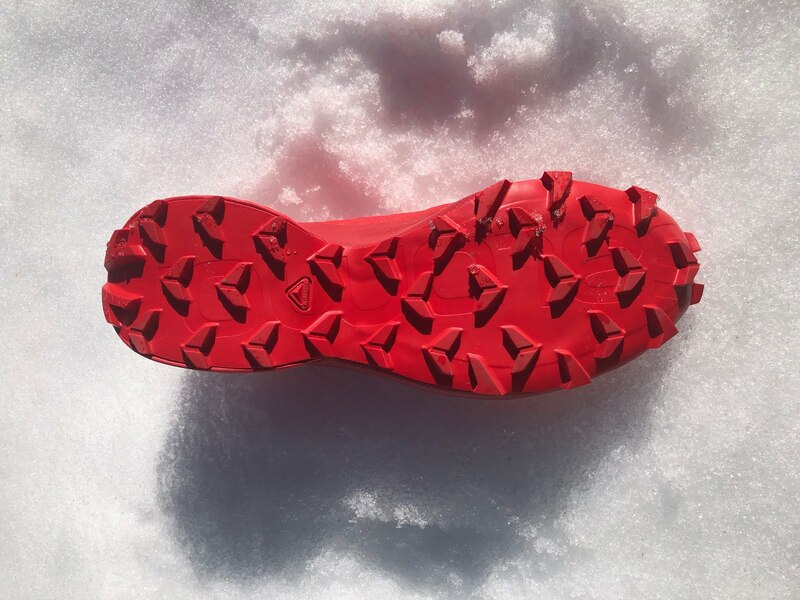 Its traction was decent on snow but not quite at the level of the others as its MegaGrip outsole has more contact surfaces than the others and is stiffer which on the flip side make it a stronger candidate (than Speedcross and Lone Peak) for good on rock traction and smoother terrain performance . The Hydroventure 2 has a superb upper, which by using effective overlays, and despite the stiffer eVent, provides a smooth glove like fit, hard to do in a waterproof shoe. It has plenty but not so much toe box room that hold and security is compromised. It is the lightest shoe here, weighing about the same as many non waterproof shoes .Full review soon. Hydroventure 2 is a great option for all season waterproof performance on varied surfaces. In addition to running, the Hydroventure 2, due to its secure yet roomy upper and gaiter attachments, should make it a great fast packer and thru hiker. We can't end this article without also mentioning the Salomon XA Elevate GTX. The non Gore-Tex Elevate was both Jeff and my favorite all around trail shoe of 2018 and the GTX version does not disappoint. 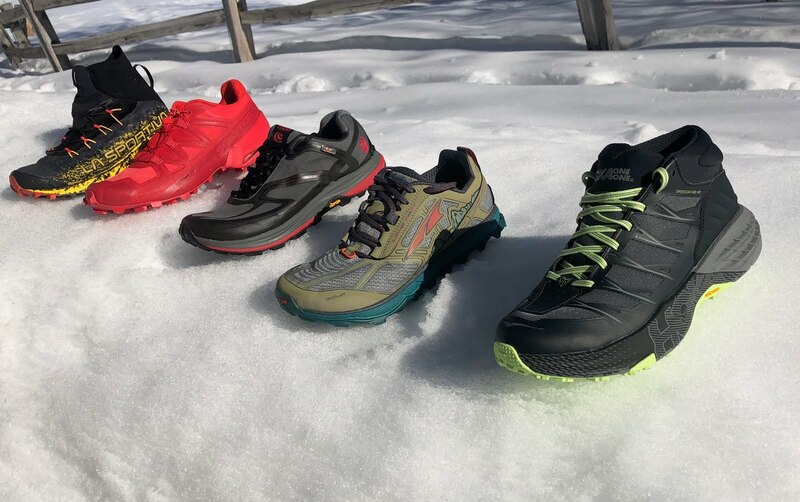 XA Elevate provides supreme traction in a wide variety of conditions, the waterproof Elevate GTX shares all of the same performance and protection of the non GTX that was at the top of our 2017 list of trail shoes. Impeccable fit and security, combined with the aforementioned protection and traction allows the Elevate to handle any type of mountain terrain and surfaces, yet is simultaneously a fine choice for snowy, but more civilized road and path runs. The Salomon Quickfit laces can also be operated while wearing light gloves. Sam is the Editor and Founder of Road Trail Run. He is 61 with a recent 3:40 Boston qualifier. He runs halves in the 1:35-1:41 range and trains 30-40 miles per week mostly at moderate paces in the 9 minute range. When he at his other place in Park City, Utah he runs almost exclusively on hard packed and often groomed snow trails. Any worries with LP4 durability? Seems to be a lot of comments in various forums that the toe comes apart or the upper rips very easily. Or do you think that's just the vocal minority?